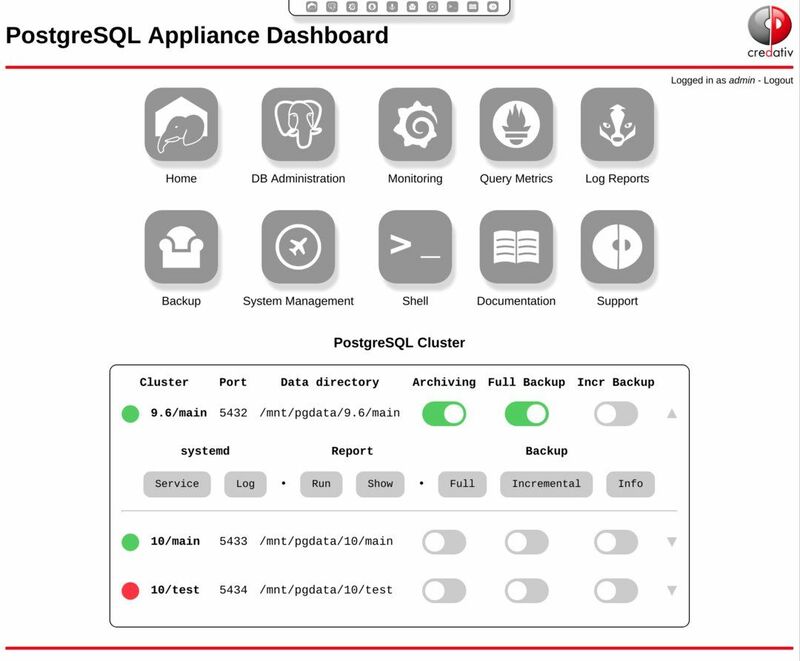 PostgreSQL and everything that goes with it, from backup to monitoring and reporting. PostgreSQL is the most important RDBMS for many users today. However, for smooth operation, a performance enabled environment is required to cover all functionalities at its best. Out of the need to develop “stand alone” database servers that could be used as an appliance without any further dependencies on the own infrastructure, this project has arisen. The wheel is not reinvented. Instead of new developments, established and reliable open source projects that fulfill the needs of the specific aspect are assembled into the Elephant Shed PostgreSQL appliance. These are integrated within a single user interface developed and provided by the PostgreSQL experts at credativ. Automated scripts in the background ensure that the interaction of all these tools runs smoothly. For example, new clusters or databases are automatically added to the monitoring, jobs are created for generating the reports and a backup task will be prepared. All this is done without the need for manual work. 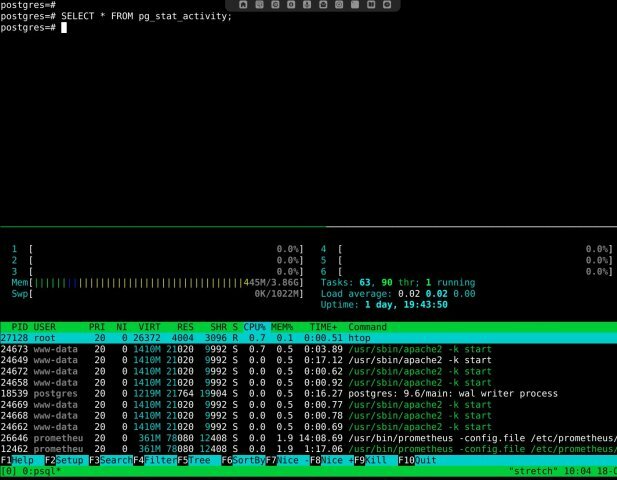 The processes and automatisms are implemented in a modern way by using systemd. The greatest effort was not made in developing the GUI but in assembling the packages of the individual components, as well as the integration of the individual components into a single and effective system. Many new packages have been created for the Debian GNU Linux operation system as part of this work (e.g. pgAdmin4). To give all Debian users the benefit of this work, we are already in the process to fully integrate them into the Debian software distribution itself for the next release. The Elephant Shed offers a full blown web interface to administrate the serverd PostgreSQL databases. You can manage database users, create or alter new schemes or change configuration. This can all be done in your browser easily. 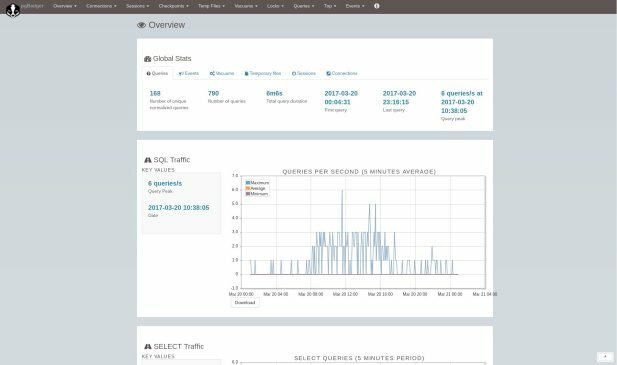 The specially developed performance monitoring enables detailed insight into the underlying system and all its relevant database metrics. Thus, performance bottlenecks can be eliminated at a glance, and possible sources of error can be identified. The monitoring system adjusts itself to the circumstances automatically. Newly created PostgreSQL instances and databases are automatically captured. A complex and error-prone configuration of the system is no longer necessary. 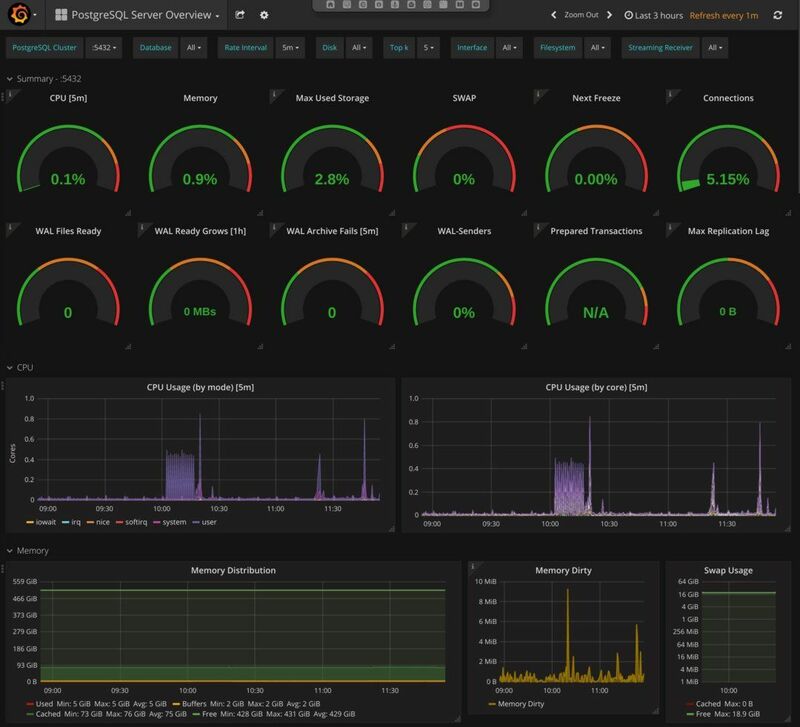 The performance dashboard is created using Grafana. Capturing and aggregation of the metrics is done using Prometheus and several exporters. Automated summary of logged events allows a quick analysis in case of need. It doesn’t matter whether you want to analyze failed login attempts or a runtime of a SQL query. The automatically generated report displays all relevant information and presents a quick overview. To access the reports, pgBadger is used. Data security is important. The backup system is preconfigured in a way, that not only makes it possible to restore the data, but also to determine the recovery time point to the nearest second. To do this, you can simply select the instance or cluster for which the Backup should be activated and whether archiving for “point in time recovery” is also desired. For the backups pgBackRest is used and supplemented by our GUI accordingly. 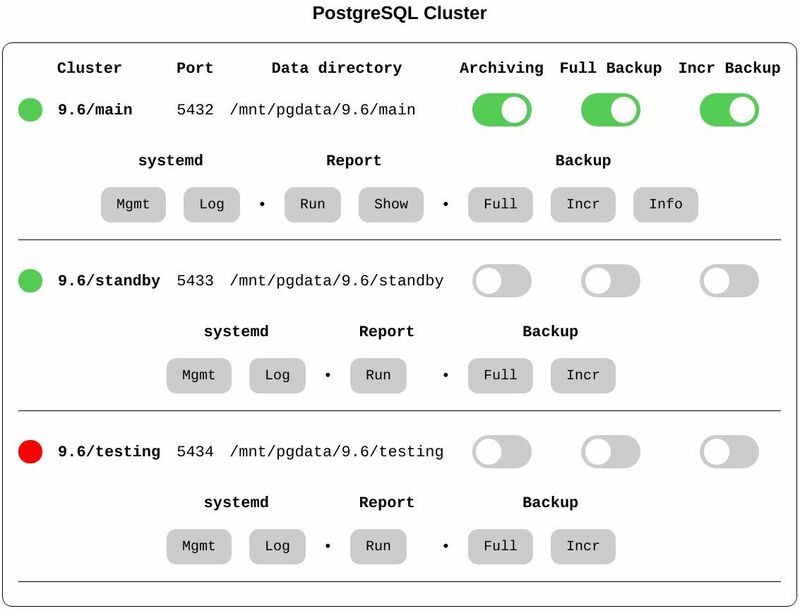 To administrate the databases, the Elephant Shed PostgreSQL appliance offers pgAdmin4, the sucessor of pgAdmin3, a wide spread administration tool for PostgreSQL. While pgAdmin3 was only available on the desktop, its successor provides administrators with a full web interface. pgadmin4 provides convenient access to the databases to be managed. In addition to the administration of users and database objects, it also offers the possibility to ad-hoc queries. All important functions to manage the underlying Linux operation system can be managed via the web interface. It allows services to be started, stopped or restarted, log messages to be viewed or the entire operation system to be updated. All management functions are implemented using the Cockpit web frontend. Also actions that require direct access to the console, can be comfortably handled via the web interface. To do this, a shell is started in the browser. A direct SSH login is not required. This is realized by Shell In A Box. Software needs to be documented appropriately in order to be usefull. Therefore, the documentation for the Elephant Shed PostgreSQL appliance is delivered with the package and can be downloaded via the web interface provided. Of course, updates are automatically executed and the appliance is kept up-to-date. Wherever possible, direct links to the corresponding modules are provided. The documentation is also available online, elephant-shed.io/doc. Elephant Shed is supported on Debian 9 (Stretch), Ubuntu 18.04 (Bionic), and RedHat/CentOS 7. Packages are available for the amd64 (64-bit x86 Intel) and ppc64el (64-bit IBM POWER, Debian only) architectures. Get the source or fork us! Do you have any question or want to know more? Do you need professional support or additional services? 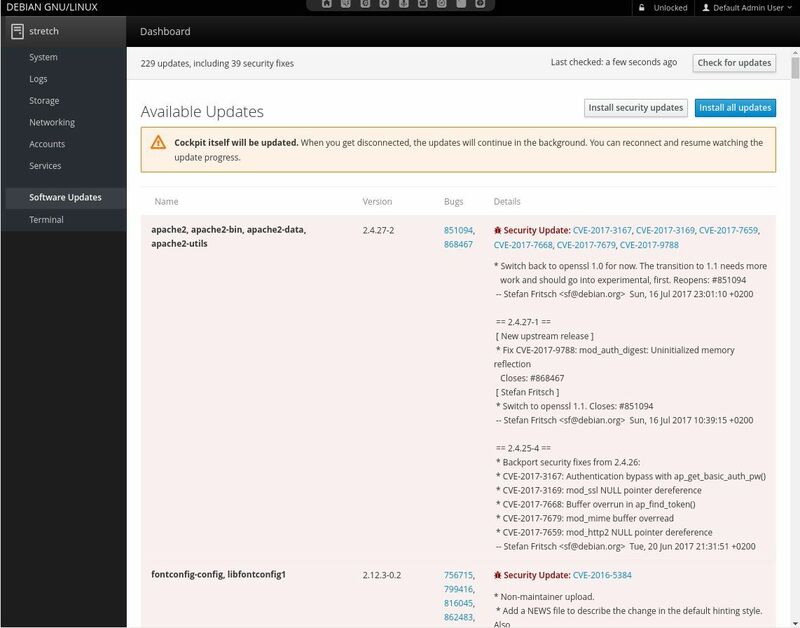 Elephant Shed is an open source project, developed and maintained by credativ. For the Elephant Shed PostgreSQL appliance, credativ offers comprehensive technical support with service level agreements, which are also available on 365 days a year and 24 hours a day as an option. Installation and integration support, as well as an introduction to the Elephant Shed PostgreSQL appliance is of course also part of credativ’s services. If you are interested, please feel free to contact us. For further questions or support, we are available from Monday to Friday from 9:00 am to 5:00 pm CET.